We can learn to use the seasons as cues for self-care appropriate for the time of year. In a Midsummer Practice, we will use a cooling, yin style practice to counter the heat and movement of the season, followed by a grounding meditation. Yin yoga is mostly floor work where poses are held for longer periods of time and generally practiced in a passive manner. 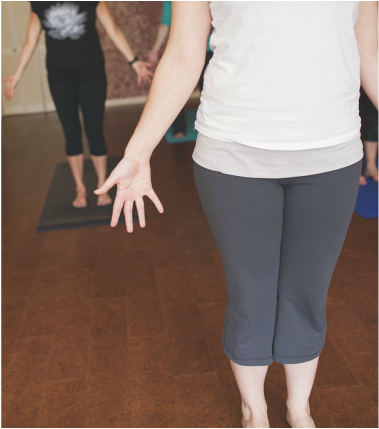 The practice is meditative and moves into our connective tissues, creating a very opening and deep experience. all levels are welcome. Ayurveda, the sister science to Yoga, is an ancient form of wellness that focuses on balancing our energy. We'll identify the three constitutions that determine the make up of our bodies (doshas) as well as the more variable changes in energy we may experience each day (vayus). Once we are aware of the basic energies that affect us, we can make choices that bring us into balance with nutrition, movement, breathwork, and sleep patterns. This portion of the session is great for those curious about alternative medicine, eastern arts, or anyone that would like a refresher on what the ayurvedic basics. Ayurvedic Meal Sharing meals with others is nourishing in itself! We will partake in a traditional ayurvedic meal, using fresh, local ingredients from our own farm friends. The meal will be vegetarian and gluten free, however if you have any other dietary restrictions, please contact us in advance. Join us in a discussion about identifying, accepting, and owning your own truth. Being authentic is something many of us have struggled with since we began to modify our personalities as early as middle school or high school. It is possible to fit in to our societal roles and still live an authentic life! The gentle sound surrounds us in this live concert of singing bowls. We can sit or recline as the sensation of the vibrations sung by the Tibetan bowls as they resonate across space, into our ears, and through our bodies. 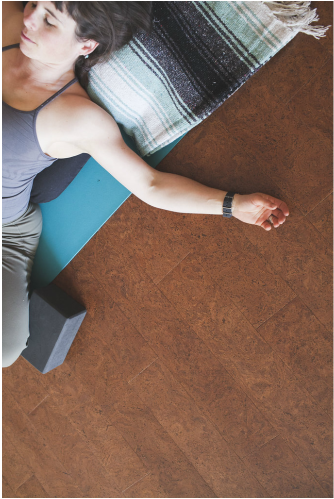 We'll slide right from the soothing sounds of the metal bowls into the practice of Yoga Nidra, also known as Yogic Sleep. It is not sleep, exactly, but starting to find a deeper level of rest. It's a systematic method of inducing complete physical, mental and emotional relaxation. Yoga Nidra is one of the deepest states of relaxation that can be reached while still maintaining full consciousness. It is a technique in which one learns to relax consciously. It is a wonderful way to end an evening of taking care of yourself! Join us with Dr. Dan Francis for an in depth look at how the body naturally holds itself, and how when we come out of alignment we end up holding ourselves out of balance, making our bodies work much harder. Much of the structural integrity of our bodies stems from the core of the body. We will talk about what the core is, exactly, and how to ensure we strengthen and stabilize from the inside out. After going over some of the body mechanics, we will take a walking meditation, with a focus on each step being intentional and supportive. Walking meditations can be done in numerous ways, but nearly always in personal silence. If focus isn't on the movement you make, it might be on the sounds that surround you, the beauty that you see, or, as always, your breath. Meditations in movement are a great technique when feeling restless, or the simple need to be in nature. Thai yoga, or "Lazy Man's Yoga" is an ancient healing treatment that involves yoga, ayurveda, and buddhist principles, as well as acupressure techniques. Much of Thai yoga uses pressure and stretching administered by the giver's hands, as well as positioning of the client's body into different postures, which are familiar to those who practice yoga. The aim is to stimulate energy (prana, chi) through the body, bringing balance back to physical, mental, and emotional state. This will be a light-hearted session where we will work on each other in a basic sequence that will be fun and easy to learn! Shared Meal Sharing meals with others is nourishing in itself! This meal will be based on ayurvedic principles, using fresh, local ingredients. The meal will be vegetarian and gluten free, however if you have any other dietary restrictions, please contact us. The term "somatic" simply means referring to the body. Somatic body work has been developed through several different lineages, but the basis is that our bodies store traumas that we have experienced since birth, some of which have left emotional scars, others physical discomfort or disease. We can begin to strip away the places the body holds trauma and allow ourselves to heal by using different simple repetitive movements that allow the body to feel where 'normal' is, and where 'neutral' is, and perhaps bring us into a new normal that feels balanced and energetic. Many have experienced healing in body and mind through these techniques. Having a regular seated breathing and mindful meditation practice is so nurturing for mental state. Scientific studies are now being done that show the benefits of being mindful, as well as setting aside (even a little bit!) of time each day and letting your thoughts settle. Breathing techniques are a great way to bring the mind into focus and get out of the rest of your day in preparation for meditation, where the only goal is to sit with your own thoughts and observe. Allow the snowglobe to be set down, the snow falls to the bottom, and your vision becomes clear. Restorative Yoga is the yoga of rest. This is believed to be one of the most effective yoga practices to facilitate health, well being, and deep relaxation. This practice is to open the body rather than stretch it. With the use of props, the body is supported in positions of ease and comfort. when the body is comfortable we can really learn to let go and be with ourselves as we sink in to these postures for up to 10 minutes. If you have any injuries or are pregnant, please let us know ahead of time.